On this episode of Knitting Daily TV, host Eunny Jang and experts Kristin Omdahl and Shay Pendray cover a whole range of situations that crafters often face. They explore some handy tricks of the trade to help you get through a project from start to finish. Eunny begins this episode with a couple different methods for binding off your knitting. She demonstrates two stretchy bind-offs, as well as a popular picot bind-off. For more tips and tricks from Eunny and guests of Knitting Daily TV Series 600, download your free eBook of 22 Techniques for Knitters of All Levels. 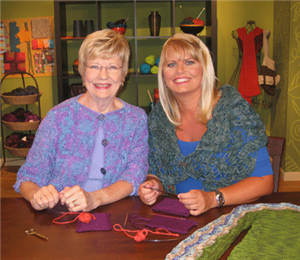 Eunny joins designer Colleen East on location who offers some tips to help you with lace knitting. 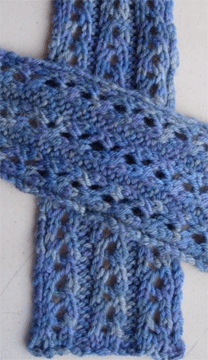 Download her free pattern for the Luxurious Lace Scarf. Kristin and Shay are back in the studio to demonstrate how to use single crochet as a traditional sewn seam. 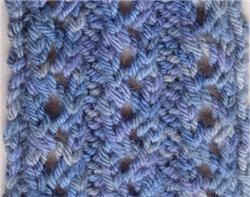 This technique is useful to both knitters and crocheters for a clean, finished edging. Deb Robson is back on this episode to discuss fiber qualities with Shay. Many people complain about fibers as being too itchy or it pills. Deb will talk about what causes these issues in certain fibers, and she'll demonstrate how to treat your yarns before and after knitting to help avoid some of these common complaints. Visit Unicorn Fibre's website for the washes she uses in this segment. Finally, Eunny is back to offer a quick tip on button hole placement and how to know exactly when and where you can add buttons to your garments. 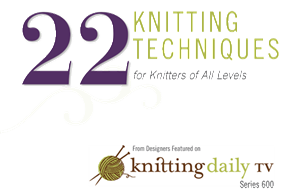 For more quick and not-so-quick knitting tips, download your free eBook of 22 Techniques for Knitters of All Levels.